Basketball is one the most eye injury prone sports in this country with close to 6,000 people suffering from injuries every year according to Prevent Blindness America. In fact, 1 in 10 college basketball players will sustain an eye injury. For children 14 years and younger, air and spring guns are the biggest culprit and among older children and adults, water sports eye injuries rank second. Eye injuries from any sport can include infection, corneal abrasions, blunt trauma, inflamed iris, fracture of the eye socket, swollen or detached retinas, or even a traumatic cataract. In some cases, a significant eye injury can cause permanent vision loss. · Make sure the lenses either stay in place or pop outward in the event of an accident. Lenses that pop in against the eyes can be very dangerous. · Fogging of the lenses can be a problem. Some types of protective eyewear are available with anti-fog coating. Others have side vents for additional ventilation. Try on different types to determine which is most comfortable. 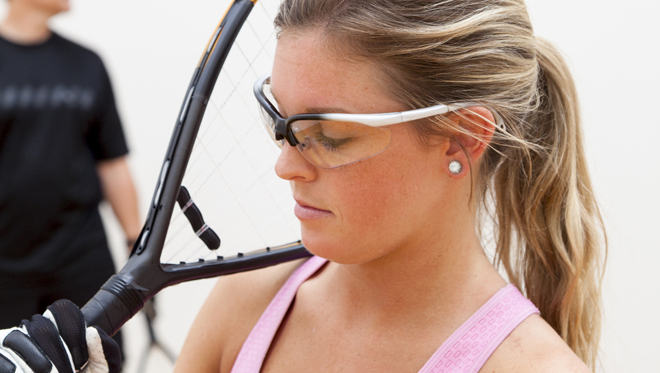 · Sports eye protection should be padded or cushioned along the brow and bridge of the nose. Padding will prevent the eye protection from cutting the skin. · Try on the eye protector to determine if it’s the right size before purchasing. Adjust the strap and make sure it’s not too tight or too loose. All athletes should get annual eye exams to detect a vision problem and improve performance, in addition to prevent vision loss later.